We get asked this question a lot, I guess because so many people have cast iron cookware or Dutch Ovens, and they automatically think that because cast iron is an efficient heat distributor and retainer that it would work well with a solar cooker. And it can work well in a solar cooker, but it should not be the cookware of choice for most solar cooking applications. the best choice for solar cooking because it can take much longer for cast iron to heat up as opposed to the more popular and common solar cooking cookware; enamelware or graniteware. Many times when one chooses to solar cook they often find that time is of an essence, due perhaps to the conditions of the day and as well as the time of the day that one may start their solar cooking. And if one is limited in time and the conditions are not ideal, it would not be beneficial to the cooking process to have a slow heating cast iron pot. On the other hand, enamelware is thin, quick heating and transfers the heat more rapidly to the food inside of the pot/pan. Now, If you have a long day with ideal, sunny conditions and time is not a concern, then by all means, use cast iron in your solar cooker and it will cook just fine. On a parabolic cooker cast iron will do fine as well because the heat produced by the parabolic is much greater and it will cook as quick as your stove top will. In fact you may find that you still might want to add a steel plate or such to help diffuse the heat that your cast iron is receiving. 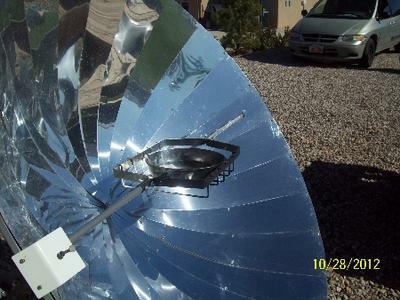 ...I use my solar parabolic cookers to cure my cast iron as well since it can heat the cookware very quickly and maintain the hot temps for a good period of time...and it keeps the smell of burning oil outside. Comments for Can I use Cast Iron on/in a Solar Cooker? Thanks, Nathan. I definitely wrote that comment as additional thoughts, not a contradiction of what you'd written. I find it really interesting how different the solar cooking experience can be in different parts of the country/world. In a lot of ways the basics are the same, but the tweaking to make it really work for a given time/sun situation, etc. seem almost personal to each day one tries to cook. We're finally getting perfectly clear days here now that the temperature has dropped and summer rains have stopped. Thanks for giving your perspective and experiences with cast iron and solar cookers. I am glad to hear that it has worked well for you. It also sounds like you know what you are doing and how to do it so that the results turn out well. I mainly cautioned about the use of cast iron because there are those who are not quite familiar with all of the important aspects of solar cooking that can affect outcomes, and some have not had great results when using cast iron due to some of the factors I indicated. In fact even when using thin, dark cookware their results were not good because they did not take into consideration many important factors that are sometimes necessary when solar cooking. I always appreciate your input and your knowledge. Cast iron is actually a favorite cookware for using in my solar oven in Florida. The initial lag in heating up is not really a problem here, because on our hottest summer days, we have good strong sun fairly early in the morning. I do not really find that it takes very long in those conditions for the cast iron pan to heat up. However, after the initial clear sky, we tend to have a lot of issue with clouds coming and going throughout the day. Any delay in heating up the pan initially is more than compensated for by the fact that the pan stays consistently hot, even when the sun is not consistent. I can see how cast iron pans would not be beneficial for solar cooking in other places, but often find them to be the best choice here. In fact, when I am baking bread, I will often prop a bread pan inside my dutch oven, because it really does get and stay so consistently hot even when clouds are doing their level best to keep the sun playing hide and seek.